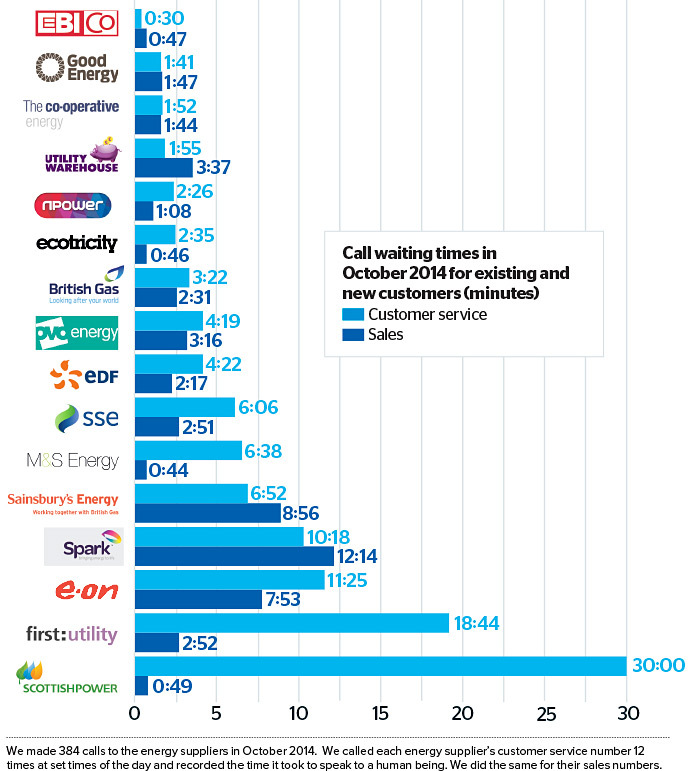 Which energy firm takes 30 minutes to answer its customers’ calls? 30 minutes is the average time it takes Scottish Power’s customers to speak to a human being if calling its customer service line. But it will take you less than a minute to get through to Scottish Power if you’re a potential customer calling its sales line. Our investigation – where we made a total of 384 calls to 16 energy suppliers’ customer service and sales numbers – comes amid Scottish Power being under threat from the regulator Ofgem. The supplier must shorten average call waiting times to two minutes by the end of January or face a sales ban. If you are fed up with your energy supplier, find out which are the best and worst according to the energy suppliers’ own customers. Read our reviews of energy companies. This is the fourth time we’ve run this mystery shopping investigation and the results are still not good enough. Only four out of the 16 companies we called took less than two minutes to answer the phone to existing customers. And they can’t blame it on price rise this time. When we spoke to Scottish Power, it apologised, blamed a new IT system and said it’s hiring more staff to improve levels of customer service. But answering the phone quickly is not impossible. Ebico has managed to answer calls in less than 30 seconds on average in all of our four mystery shopping investigations so far. Npower, which used to do pretty badly on call waiting times in our past investigations, seems to have improved. A year ago it took 19 minutes on average to answer calls to its customer service lines. This time it took just over two minutes on average. Which? executive director Richard Lloyd said: ‘It’s unacceptable that some energy suppliers expect their customers to wait on the phone for so long just to ask a question, give meter readings or complain. With average waiting times of up to half an hour, it is clear some suppliers need to pull their socks up’. ‘Our research shows only a quarter of us trust our gas and electricity supplier, which is why we need major reforms to fix the big six. Suppliers must rapidly improve basic standards in customer service now and not wait for the outcome of the competition inquiry’. You can find out more about our campaign to fix the broken energy market – Fix the Big Six. Can you save money on your heating bills with a wood burning stove?